The FTSE’s flirtation with the 5000 level looks as though it might be short lived as European markets start the week with a sell off. The FTSE 100, CAC and DAX are down around 1% in early trading with US futures indicating that Wall Street will open down by a similar amount this afternoon. The weekend sentiment has been on the negative side with fears that Obama’s plans to raise the tax rates on certain Chinese imports will start a trade war that could harm the global economic recovery. There are no top tier economic announcements due today, but speeches from FOMC members Lacker and Yellen in the afternoon could create some ripples in the dollar pairs. As the London session hots up, there are some interesting moves afoot. Last week the dollar was out of favour, but this morning it is one of the strongest currencies overall. The are big gains for the dollar against the pound, Aussie dollar and Canadian dollar as oil prices slip below $70 and commodity prices slip. The yen seems to be moving more in line with the dollar today with similar moves against the same currencies. The exception appears to be the euro which although down today, has not fallen by as much as other major currencies against the yen and dollar. This makes the euro vs dollar today’s pair in play. 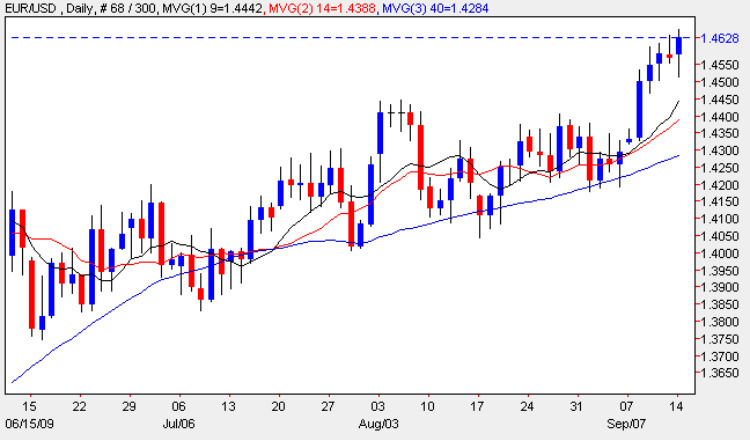 In the last four trading sessions the EUR/USD has tried and failed to hold above the 1.4600 level. With the likes of the pound still struggling, it is perhaps unlikely that EUR/USD will find enough momentum to hold the level today. A double (down) trade might be the best way to play this, especially if the price gets closer to 1.4600 today.